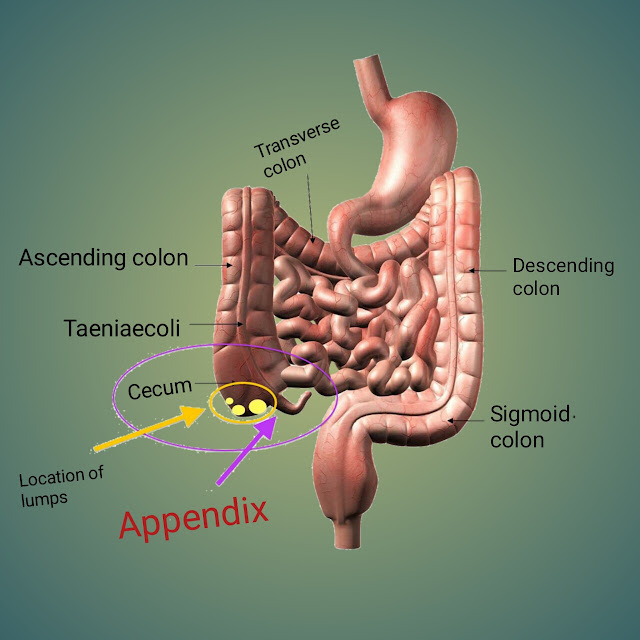 Appendix -My dear friends today's post, we will know about the symptoms, reasons, prevention and treatment of appendix patients, and if you have any information about it, then definitely tell us. In the lower part of the small intestine (colon) and colon joint (CAECUM), we have a mouth on the inner tail (appendix) of it, similar to a thin small sac. It is about 3 or 3½ inches in length, but its length sometimes increases to 9 inches. It's only a quarter-inch thick. The swelling that occurs in the bowel of the intestine is called appendicitis. In many cases, the appendix itself is swollen, which is easily cured by the treatment of medicines, but sometimes the inflammation spreads in all the fibers of the intestine. In such circumstances, surgery is the only treatment, otherwise it can burst and prove to be fatal. What happens to the appendix? Doctors first believed that the appendix is ​​an extravagant organ in the body and there is no use of it. But later research found that appendix is ​​a necessary organ for a healthy body. Good bacteria are stored to digest food, which help in digestion. When there is a lack of bacteria due to a long illness in the body, the work of appendix is ​​to keep the digestive system properly. The main symptoms of appendix include - fever, dizziness, vomiting, back pain, excessive amount of gas, loss of appetite, pain while urinating, severe infection like appendix can be symptoms. There is a lot of gas in the stomach, but there is a problem in taking it out. Apart from this, signs of constipation and diarrhea are also seen. In the condition of appendicitis, there is a very severe pain in the stomach below and around the navel, due to which the patient begins to suffer. This pain changes its position and in the end, a few below the right side of the navel stops pain in the south. In this disease, due to the stomach effect, the white layer gets formed on the tongue due to this disease. Mittal and vomiting also occur, and tremor also leads to a fever ranging from 101 to 102 Fahrenheit. The pulse rate of the rogee goes up to 120 times per minute. The patient keeps stretching his right leg, because doing so, he feels some relief from the pain. The pain on the stomach is more painful in that place and due to swelling, it starts showing up. The patients of appendix experience a lot of difficulty in getting up and sitting and shrinking and stretching right leg. For this reason, often the patient does not move. The stomach and stomach muscles on the side turn stiffly. Apart from this, the patient may be suffering from constipation and many patients also have diarrhea. The white particles (BC) of the patient suffering from appendix are increased. The appendix does not have any relation to eating or not and it hurts at all times lives. This pain increases on exercise and diligence. 80% of patients suffering from X-ray or Barium's anemia can be detected by checking this disease. The diagnosis of this disease is late in pregnancy, because appendix is ​​covered with uterus at this time. The pain of appendix occurs in the lower right side of the stomach or between the abdomen, along with fever and vomiting. If it is not operated soon, the fear of appendix bursts is higher in pregnancy. Once appendicitis is identified, it is the right step to get her operation done soon. For recognition, sometimes MRI It may also be needed. Appendix can be operated by laproscopy in the first six months of pregnancy; But after this there is a need to open the abdomen and perform surgery. Together, it is important to give antibiotics so that the infection can not spread. The likelihood of having a baby before abortion and time increases due to appendicitis. In such circumstances, the weight of the newborn is also reduced. Those who are not non-vegetarian, this disease is rarely seen. The main cause of this disease is constipation. From the interruption of the appendix intestine. However, according to modern medicine, the bacteria that are called the cause of the appendix all healthy individuals are seen within the intestines. With this, we also tell that due to constipation, this disease occurs, there is no such thing, but rather, whose body is filled with exotic fluid, only they have this disease. The most effective way to protect against internal diseases like appendix is ​​to take regular health check and healthy lifestyle. To avoid the disease of the appendix, it is important to eat more fiber foods, green vegetables, salads and more. Drink plenty of water. Do not eat junk food, smoking drinks. Reduce the pain from the hot water bottle to the place of pain. Sitting with a pillow is a little less painful to the patient. Relaxil manufacturer- Franco Indian: 2-3 times a day on the grave of this ointment Massage with light hand. Caution: Do not strip after applying this ointment. MEDI CREAM Producer Rally: By applying this cream, the patient gets some relief. If patients of appendix have been treated with upper treatment ie medicines and still relax If you do not get any surgery then it is the only successful treatment in the hospital. Even after the operation is not done and the swelling is removed, this disease can be repetitive or it ruptures as it develops and spreading the pus in the stomach (Pus) can spread infection (infections) and the disease can reach even more dangerous stage. .
Leproscopy (By telescope) is also available for treatment. In this way, 3-5 millimeters of holes are pierced and inside the body, it is seen through a telescope, this is almost the process of painless treatment. Cook the juice of green leaf juice on fire. When the juice gets torn, filter it 100 minutes Lee. In Sherbat Dinar 50 min. Lee. Mix 2 times (morning and evening) in the day. Drink ginger tea twice a day for relief from the pain and swelling of the appendix. Heat the black salt on fire and dissolve the extracts in the rose and 60 minutes. G Feed the patient (along with) with asafoetida. Take 250 grams of Urad dough in the milk of the goat and sump the seeds of salty, asafoetida, salt and soya (each 5-5 grams) in it and take a thick bread on the pan Cook it on the other side and keep the raw from the other side and bake the casserole oil (Castor oil) on it and place it on the hot spot of hot pain. Fasting at the time of pain in the appendix patient is OK. If the patient is thirsty, then drink a little water. When the pain is gone, give orange, malta juice, milk, soda, glucose and liquid drinks for a few days and do not give solid food to the patient at all. After careful removal of the disease, take care of the patient's diet It is necessary to be kept. The patient should eat meat that produces constipation and leave it forever. The patient should eat lightly. More spicy masale or ghee should be avoided by steamed dish made in oil, and the habit of difficulty and late-digestive food and hasty eating habit should also be abandoned for ever, because food and drink This disorder can re-emerge again. The patient needs to eat the available and tasteful fresh fruits, salads and boiled vegetables every day. Author andFounder Hello friends my name is Ram Gadri. I am a BSC student. My age is 20 years. I started blogging September 2018. HOW TO CHECK THE PURITY OF HONEY AT HOME? MALARIA: SYMPTOMS, TREATMENT, AND PREVENTION.